What do cruise ship management software and data warehouses have in common? One answer: they both depend on intermittent data replication. Large vessels collect data to share with a home base whenever connectivity permits. If there is no connection, they just wait until later. Data warehouses also do not replicate constantly. Instead, it is often far faster to pool updates and load them in a single humongous batch using SQL COPY commands or native loaders. Replicating updates in this way is sometimes known as batch replication. Tungsten Replicator supports it quite easily. To illustrate we will consider a Tungsten master/slave configuration. (Sample setup instructions here.) In this example MySQL-based web sales data upload to a data warehouse. The master receives constant updates, which then apply at controlled intervals on the slave. The first step is to turn off the slave replicator. Login to the prod2 host and execute the following command. 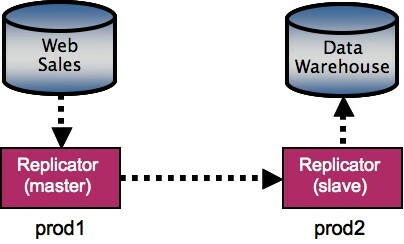 The prod2 slave will disconnect from the master as well as the data warehouse. Updates now accumulate on the master. We can turn on the slave to fetch and apply them all, then go offline again using one of three methods. The first method uses the current sequence number on the master. Here are sample commands to fetch and apply all transactions from the master up to the current master position. As you can see, the first command locates the master sequence number. The second command tells the slave to go online and replicate to sequence number 19600. Finally the third command waits until either slave is back in the offline state or 300 seconds elapse, whichever comes first. This is not strictly necessary for replication but is very handy for scripts, as it eliminates a potentially awkward polling loop. Note in this example that you must pad the binlog offset out to 16 digits, which means you must add the extra zeros shown in bold. Tungsten compares native replication IDs as strings, so that we can handle other databases besides MySQL. This normally a minor inconvenience, unless you don't know the trick. In that case it could be a bit of a head-scratcher. When using any of these techniques, we may want to know whether Tungsten will really go offline at the correct point. Fortunately, there's a simple way to find out. The trepctl status command shows pending requests to go offline. Let's say you check status after requesting the slave to replicate to a heartbeat as in the previous example. It is simple to see from the status output that Tungsten will go offline when it sees a heartbeat named batch1. As this article shows, the trepctl online and trepctl wait commands make it very simple to implement batch replication. You can simplify still further by wrapping the commands in a short script written in your favorite scripting language. Either way you have a handy solution to a problem that affects a diverse set of applications. This is not the end of Tungsten features to enable batch replication. Tungsten has a new applier that can submit transactions using CSV files, which is critical to load transactions quickly into data warehouses. We have been testing it out with Vertica, where early results show that it improves load performance by a factor of 100 or more in some cases. I will describe this new feature in an upcoming article. Please take this warning seriously. Now there are a lot of great resources about data management on the web but the aforementioned rant is not one of them. If you plan to write technical articles and have people take them seriously, here are a few tips. Sign your name. Readers are more impressed when they see you are not afraid to stand behind your words. Explain what problem you were trying to solve. Otherwise uncharitable readers might think you just started pumping information into a new database without thinking about possible consequences and now want to blame somebody else for your bad decision. Explain how you could do better. Not all designs work out, so propose alternatives. Readers love to see authors demonstrate that they are not discouraged by adversity. As for most of the points made by the anonymous author, all I can say is: well, duh! MongoDB behavior with respect to global write locking and transaction durability is obvious from the official documentation. These features are not my cup of tea, but it's also not as if 10gen is hiding them either. Moreover, most people understand that new DBMS implementations have problems, not least of all losing data now and then. You usually pick them because they have features that make it worth putting up with the immaturity. I am not an expert on MongoDB, but I can say from experience it is amazingly easy to load JSON objects into it. The up-front usability alone demonstrates excellent engineering. I am sure for this reason that there are many other good features. p.s., Here is a point-by-point response from 10gen, helpfully pointed out by Alex Popescu.